Cheap Bicycle Insurance Quotes Ireland! Review cheap Irish bicycle insurance quotes. Our great value pedal cycle insurance will cover accidental damage, personal accident, theft and breakdown. Buy online today and save! 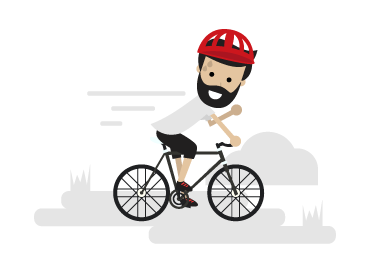 Bicycle Insurance benefits correct as of Monday 1st January 2018.
Review cheap Irish bicycle insurance quotes today and buy online. A standard bicycle insurance policy should cover a bicycle (and bicycle owner) used for fun, commuting or sport against unfortunate incidences of theft, damage, breakdown and personal injury, including death. Please note benefits, terms and criteria may vary, we recommend that you read the insurance schedule and policy wording carefully. We have outlined some frequently asked questions below for you to review. As bicycles become more advanced and expensive they attract even greater attention from unsavoury character, who can steal and resell a bicycle within 24 hours. Theft cover means the insurer will replace the bicycle if it is stolen, replace parts that have been stolen or fix the damage done to the bicycle after a failed theft attempt. Terms, conditions and limits may apply. An insurance policy will cover you if your bicycle has been damaged due to an accident. In the event your bicycle develops a mechanical fault not covered by your warranty, your policy should cover the cost of these repairs. Terms, conditions and limits may apply. With more and more cars, articulated trucks, buses and the Luas on the road, it is vital to insure yourself against injury while out cycling. You will receive compensation for personal injury including loss of limbs, sight and total disablement. If your accident results in your death then your beneficiary will receive the compensation. Compensation amounts for the above typically range from five to ten thousand euro. Terms, conditions and limits may apply. Am I covered if I bring my bicycle abroad? There are policies that offer Worldwide cover, limits, terms and conditions may apply. Does cover apply to new and older bicycles? Most insurance packages cover new and not so new bicycles; however bicycles should be of a certain age or less before they will be accepted on the policy. Typically up to a maximum of three years old. Once insured, your bicycle will stay covered for as long as you maintain your premiums. Do I need evidence of cost/ownership? As with most types of insurance, it is important to keep receipts, photographs, frame/model numbers etc. Without this information you may not be offered cover. Will I have to pay an excess amount in the event of a claim? As with most insurance packages, there will be an excess limit that you will have to pay towards the claim. What should I do to protect my bicycle when not secured at home? To ensure that your policy pays out in the instance of theft, it is important that you safeguard your bicycle while out in public. The very first thing you need to invest in, is a certified lock, which should always be used to lock your bicycle to a permanent object. You are not covered if you leave your bicycle in an unsecured vehicle. You are not covered if you leave your bicycle in a convertible vehicle where the roof has been left open or is easily removed. You are not covered if you store/leave your bicycle in an unsecured building/site. You are not covered if you store your bicycle in an opened vehicle boot or roof rack, if there is nobody in the vehicle. You are not covered if you have given your bicycle to a friend, colleague or relative. Even with immediate family members, it is imperative that you add them to the policy. You are not covered if you leave your bicycle unattended in public without having locked it to a secure object. You are not covered if you have failed to follow the manufacturer’s instructions/guidelines. You are not covered if you have damaged or deliberately put your bicycle at risk. You are not covered if you have failed to keep your bicycle in good working order through proper servicing and maintenance of breaks, etc. You are not covered if you have failed to put the necessary accessories onto your bicycle e.g. lights, bell, etc. When you allow a non-approved person to repair your bicycle. Normal maintenance expenditures e.g. repairing a puncture etc. Any repair carried out not previously authorised by the insurer. Costs related to the non-use of the bicycle. Costs relating to a claim made within a certain period of taking out or modifying a policy e.g. generally within the first 14 days, however this will vary depending on the insurer. Costs relating to accessories such as tyres, etc. unless the bicycle has been taken or damaged during an attempted theft. Accessories not originally part of the bicycle at the time of purchase. Any claim resulting from acts of war, nuclear incidents or the effects from an overhead aircraft’s sonic boom. When you are deemed to have been liable for the incident resulting in the claim. Value added tax, if you can reclaim this through your company. Any incident not covered specifically by the policy. Bicycle insurance benefits, criteria and definitions may vary from insurer to insurer so its important to read the policy wording carefully. Thank you for visiting our bicycle insurance website, safe cycling!